Most people wouldn't think about something as energetic as water activities including rafting and kayaking in Christchurch when planning a trip. But the region is packed with fast flowing rivers that are just perfect for some adrenaline-pumping fun. Heading to the pretty harbour town of Akaroa, 90 minutes east of Christchurch is a chance to mingle with marine wildlife while you kayak in a picture postcard setting. While rafting is a high octane way of exploring the rivers and canyons of the west Canterbury Plains. The Waiau Gorge near Hanmer Springs, is one of Canterbury's most popular, and wildly beautiful, rafting destinations, with many professional operators waiting to indulge you. Peel Forest is another spectacular venue, and is worth staying overnight. The Rangitata Gorge here provides all levels of rapids, and has some breathtaking challenges for the seriously adventurous. Good camping and lodge facilities in the area, too. 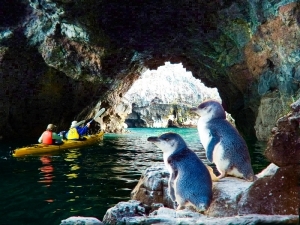 Sea kayaking around Flea Bay, Akaroa, either in the open sea or sheltered bay. Get up close with seals, dolphins and penguins in the sheltered bay, and marvel at the maj.